Teller in 1958 as Director o the Lawrence Livermore Naitional Laboratory. 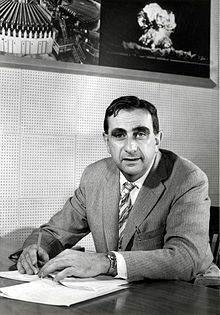 Edward Teller (Hungarian: Teller Ede; Januar 15, 1908 – September 9, 2003) wis a Hungarian-born American theoretical pheesicist who, althou he claimed he did nae care for the teetle, is kent colloquially as "the faither o the hydrogen bomb". ↑ 1.0 1.1 Hoddeson, Lillian (1993). "Setting up Project Y: June 1942 to March 1943". Critical Assembly: A Technical History of Los Alamos During the Oppenheimer Years, 1943–1945. Cambridge, U.K.: Cambridge Univ. Press. ISBN 0-521-44132-3. ↑ Academies, National Academy of Engineering, National Research Council of the National (2003). "Biographies". The carbon dioxide dilemma : promising technologies and policies ; proceedings of a symposium, April 23–24, 2002. Washington, D.C.: National Academies Press. pp. 129–140 . ISBN 0-309-08921-2. This page wis last eeditit on 3 Mey 2018, at 05:24.